A Belgium training session at Estadio Manoel Barradas the day before the World Cup Round of 16 match between Belgium and the United States at Arena Fonte Nova in Salvador, Brazil. 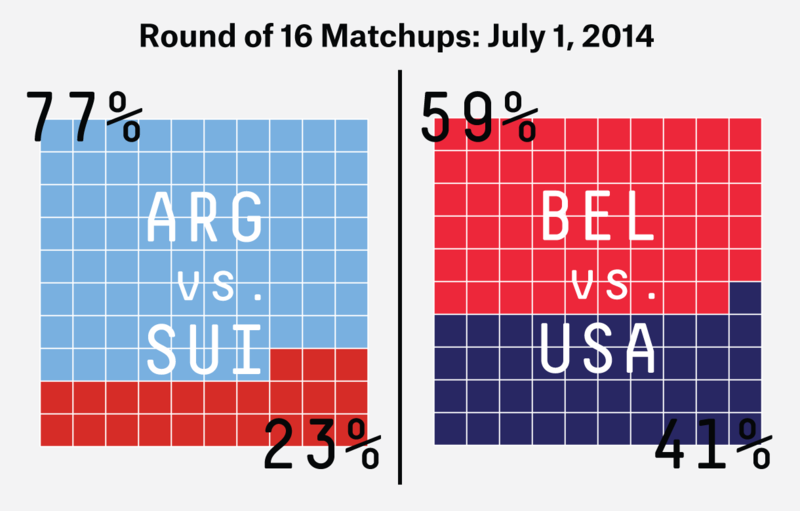 Last week, we told you the U.S. had a 1.2 percent chance of winning the World Cup. The odds of that dream have dropped by half since then, without the U.S. playing a match: Underdogs like the U.S. have come oh so close before without winning a match in the knockout stage. Heading into Tuesday, the last day of the Round of 16, six group leaders have played six group runners-up in the knockout stage. Nearly every match has been close-fought and competitive. Brazil and Costa Rica needed penalty kicks to advance. Germany went to added extra time. The Dutch needed to come from behind in the final minutes. And France was locked in a scoreless battle until the final 20 minutes. Yet in every case, the group leaders won. That’s bad news for the U.S. and Switzerland, the two remaining group runners-up, for two reasons: First, if they do manage to upset Belgium and Argentina, respectively, difficult opponents await. In their half of the draw is the Netherlands, sixth in the world in ESPN’s Soccer Power Index ratings. If they somehow reach the final, one of the world’s top five teams awaits. The second reason is that by winning, all the soccer powers have demonstrated they’re even better than previously thought, making it even less likely that a solid but not elite team such as the U.S. could upset them. Add to that a tweak to our model late last week, to account for the advantage favorites have in added extra time and penalty kicks, and the U.S. team’s chances of winning the Cup have dropped to 0.6 percent, from 1.2 percent after last week’s match against Germany. Switzerland’s chances have dropped to 0.7 percent from 0.9 percent after its previous match. Winning the Cup was always a long shot for these two teams, though. Reaching the quarters would be a good result for either one. And the U.S. has the better chance. It gets Belgium, the second weakest of the eight group winners, in the late match Tuesday. The U.S. has a 41 percent chance of winning. That’s nearly double Switzerland’s 23 percent chance of upsetting Lionel Messi and Argentina. Drawing Belgium in the Round of 16 was the U.S.’s reward for making it out of one of the toughest groups. Belgium advanced to the World Cup out of one of the weakest European qualifying groups, then won the weakest World Cup group. It remains a formidable opponent and is better than the U.S., with high-priced talent on its roster, much of it familiar to English Premier League fans. But Belgium is a tier or three beneath tournament favorite Brazil. After nearly beating Portugal and nearly equalizing late against Germany, the U.S. shouldn’t fear another European opponent. Switzerland, meanwhile, will attempt to earn what would be only Europe’s third win in 10 tries against South American opponents at this World Cup. The Swiss have one of the two wins so far, over Ecuador. (The Netherlands has the other, over Chile.) Ecuador is a far cry from Argentina, though. Messi has scored on four of his seven shots on target, all with his left foot. Switzerland might need Xherdan Shaqiri, who scored a hat trick against Honduras, to live up to his stretch of a nickname, “Alpine Messi,” to have a chance. Two Union of European Football Associations powers stamped tickets to the quarterfinals Monday thanks to substitutes. France beat Nigeria behind the influence of Antoine Griezmann, whereas it took an André Schürrle goal to finally open the scoring in Germany’s lively 2-1 extra-time win against Algeria. Olivier Giroud started at forward for France, but the French game really started when Griezmann replaced him in the 63rd minute. Giroud had 14 attacking-third touches and didn’t create a chance during a lackluster 62 minutes, but Griezmann provided the necessary spark. He had 12 attacking-third touches in 28 minutes, including a great scoring chance with a 1-2 ball to Karim Benzema in the 70th minute. In total, the French created six chances in the first 62 minutes and five over the final 28, converting two for goals. Griezmann was the difference, though he did not officially figure in either goal. His best “shot” was an 84th-minute close-range strike that required a reaction save from Nigerian goalkeeper Vincent Enyeama. Enyeama left the tournament with a competition-best 21 saves over Nigeria’s four matches. Although it wasn’t a shot, Griezmann’s near-post run in the first minute of stoppage time produced a goal officially credited as a Joseph Yobo own goal. The Germans, meanwhile, did not lack for attacking possession throughout Monday’s match, posting a 246-90 advantage on touches in the attacking third. In the first 90 minutes, Germany completed almost four times as many passes into the attacking third as the Algerians (125-32), but it couldn’t convert a massive advantage in chances created (18-5) into a regulation winner. Two minutes into extra time, Schürrle put the Germans ahead. He actually hit the ball on his near-post run (as opposed to Griezmann), and Schürrle was credited for the goal. But the result was the same in both cases. Has the U.S. Men’s National Team Plateaued?